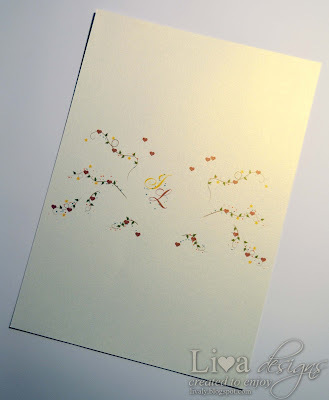 I have included free printable of those swirly flourishes in the background as well as in the inside of this invitation. You may download this PDF file here. 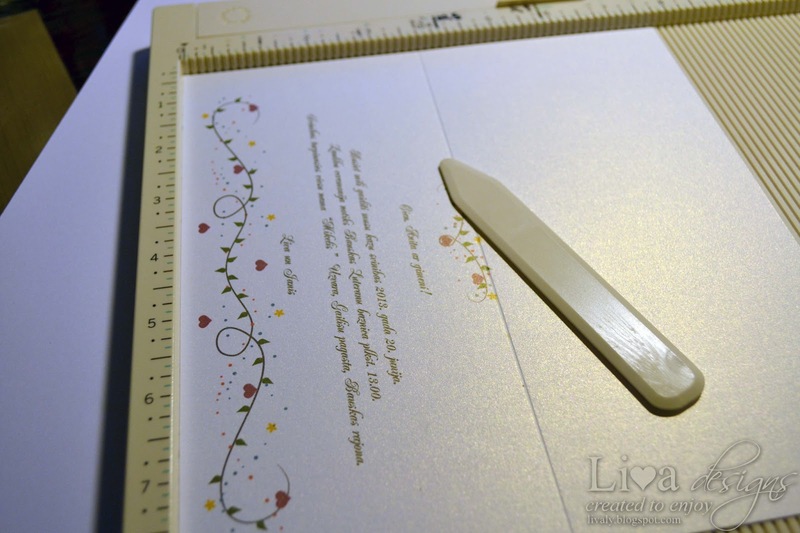 This file has embedded space for you to write in your own initials and invitation text. 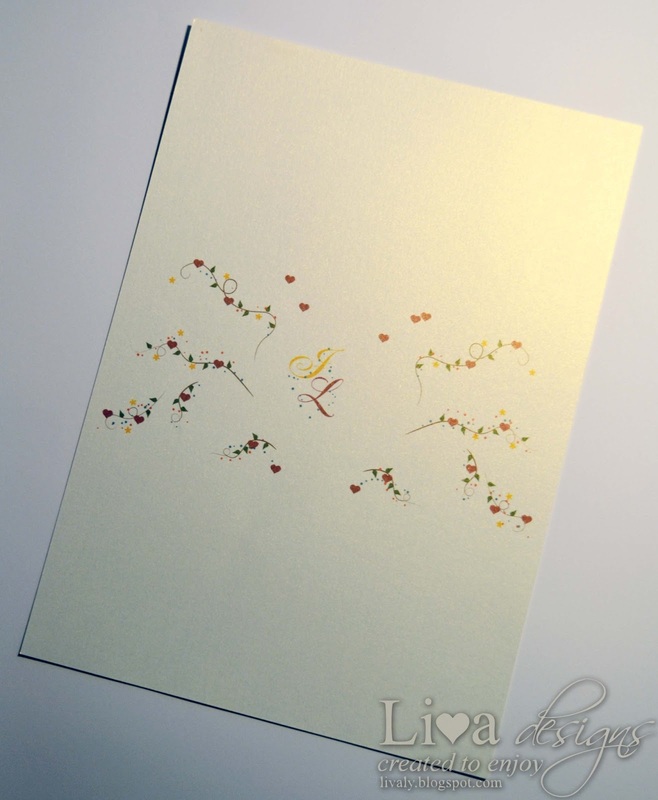 You may need to adjust your printing manner in order to print the inside correctly - I suggest to try out printing on some scrap paper before doing it on some fancy paper. This file is designed for an A4 paper, but I guess that you can easily transfer it to suit letter sized document as well. 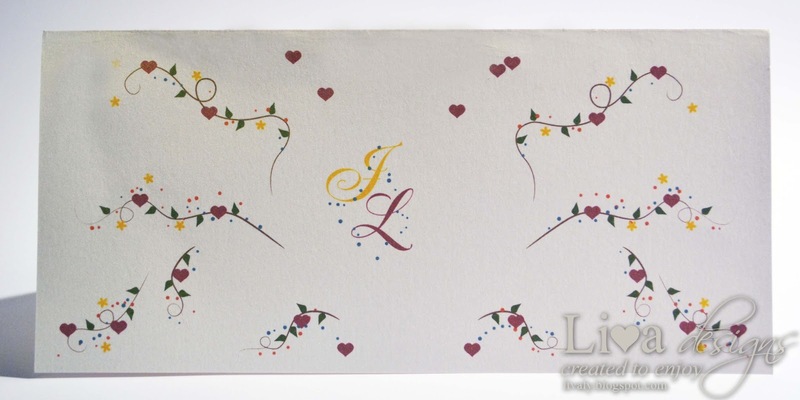 The font used for initials and inside of the invitation is Jacoba Bold and you can download it for free. 2. Cut away the bottom 1/3 part of the printed paper - in my case the cut line is 99 mm from bottom of the paper. 3. 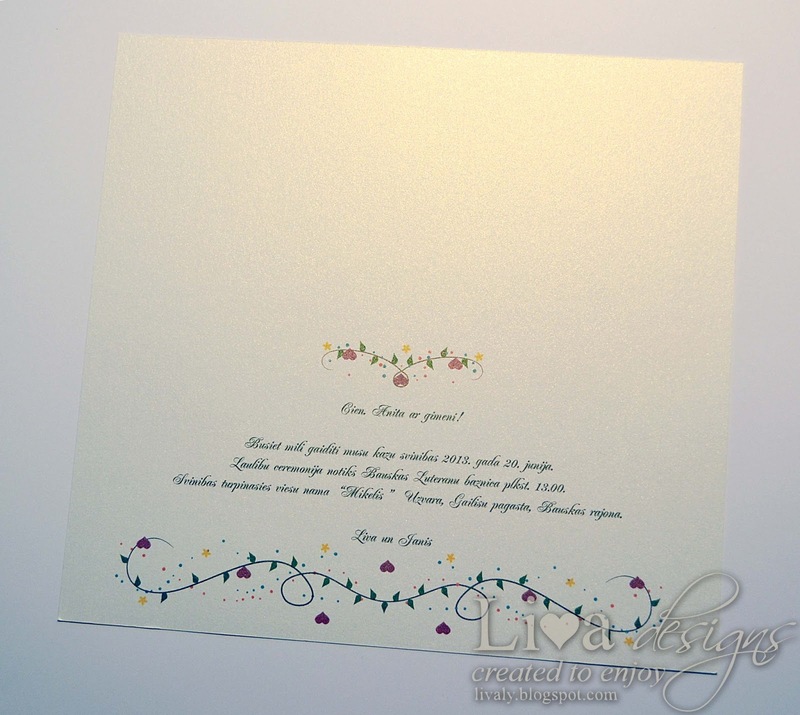 Now print the inside of the invitation - just insert the paper correctly in your printer - the correct direction varies for different printer, so as I said before, try it out on some scrap paper before. P.S. Just after printing I noticed that my hearts have turned upside down.... ...well it is just an example after all :) and this will not happen if you print from my PDF document. 4. Score the middle line on the inside of your invitation. It is 99 mm again in my case. 5. Fold the invitation in half. 6. 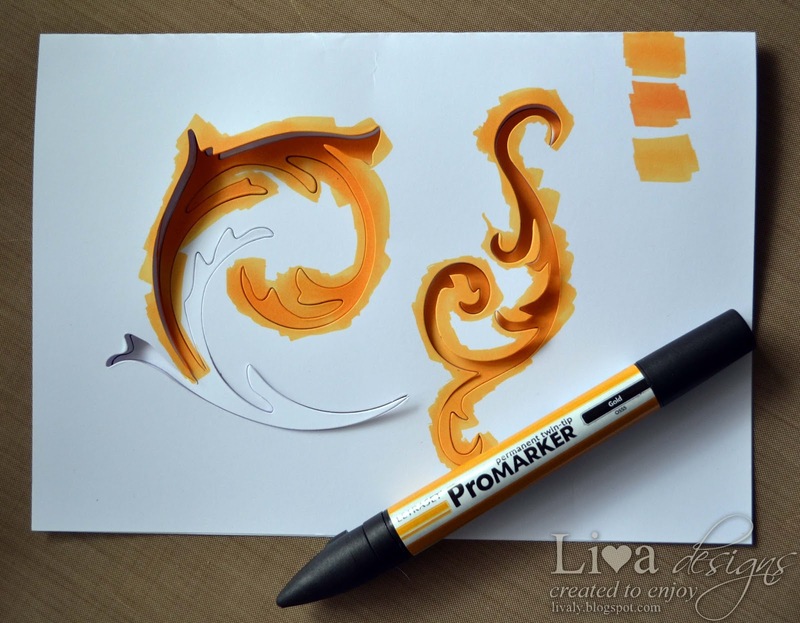 Decide what color you want your swirls to be, or do as I do - use white card and then colour whatever color I wish using ProMarkers. 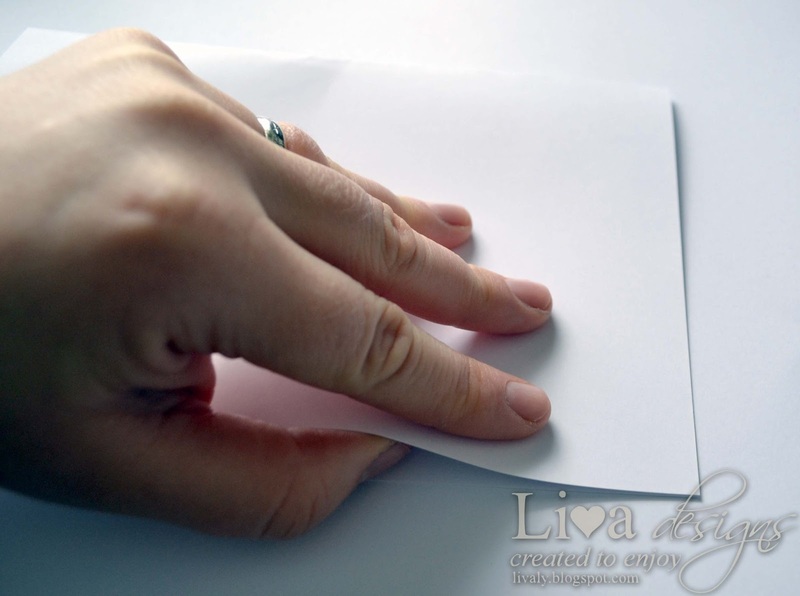 Fold the A4/letter sized cardstock in half. It may be a little tricky if you want to use patterned paper for the flourishes, as you need two smaller swirls as mirror images, but larger two flourishes the same. 7. 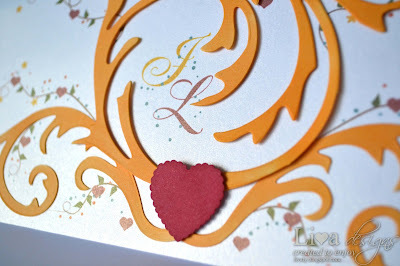 Die cut your folded card using Tim Holtz Elegant Flourishes die and your die cut machine. 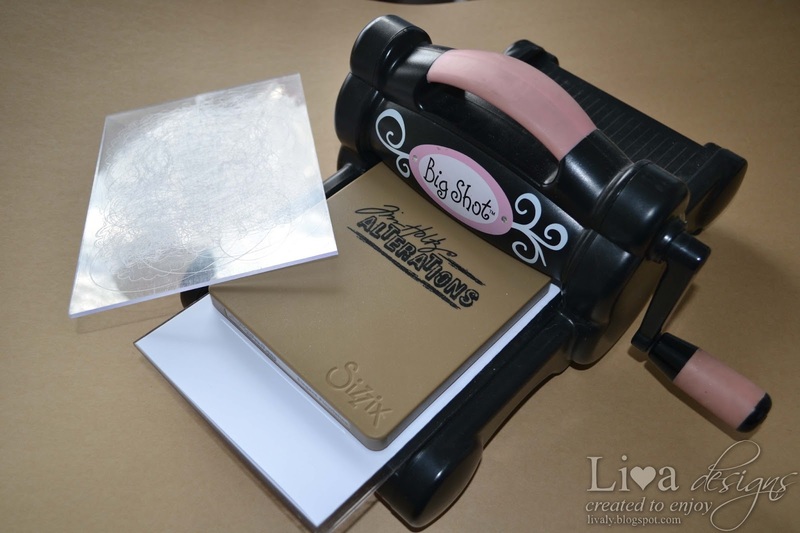 I love my BigShot as it is so simple to use - just place cutting plate, paper, die and another cutting plate on top and run through the machine. And the thing I like most is that BigShot comes with everything you need to start using almost any die there is - either thick or thin. 8. 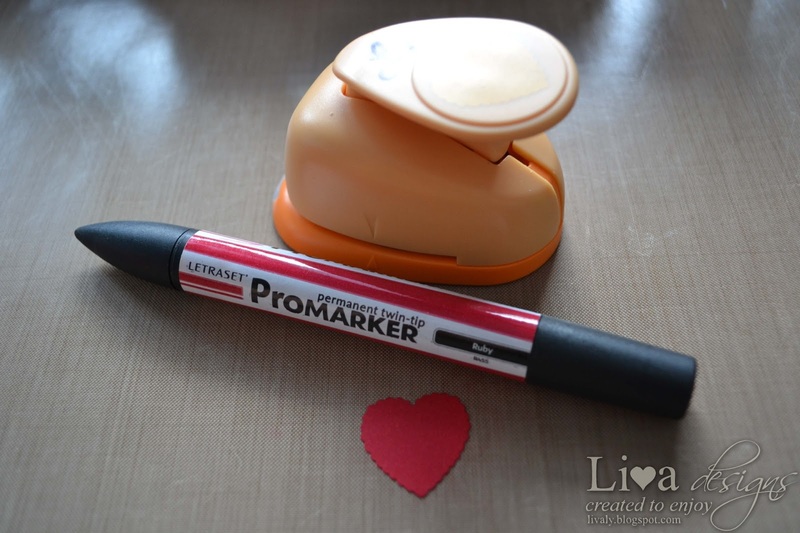 I chose Gold ProMarker to color my flourishes. 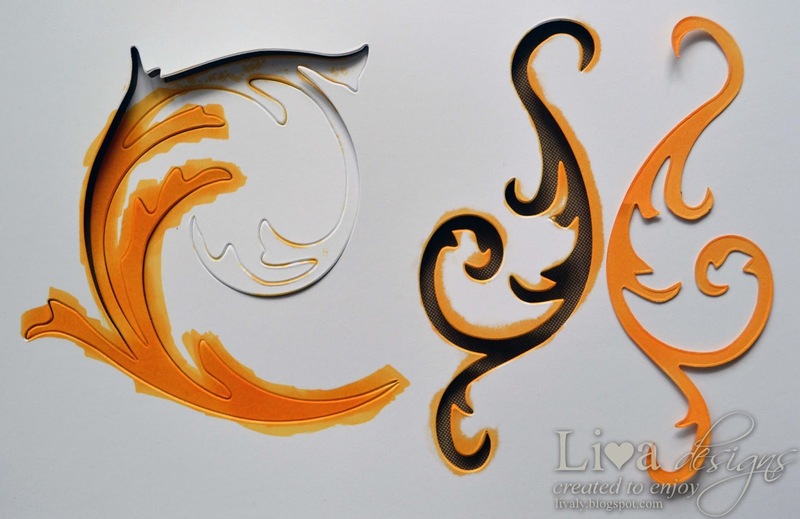 It is more easier to do this if you leave your shapes inside the paper. Just color over the first two die-cut shape and paper. 9. 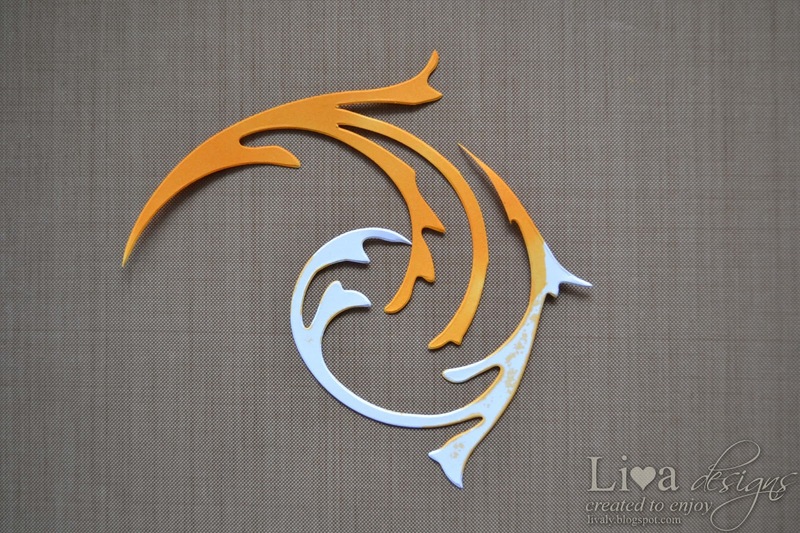 Then turn your die cut paper over and color the largest flourish as is, but flip over the smallest die (I actually opened the card to color it from the other side while it still was inside the main paper). 10. Cut away the white part of this large flourish. 11. 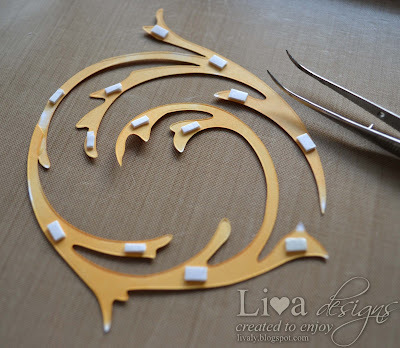 And cut away the unneeded part of the other flourish - just do it to create rounded edge. 12. Glue both flourishes together as shown in the pic above. 13. 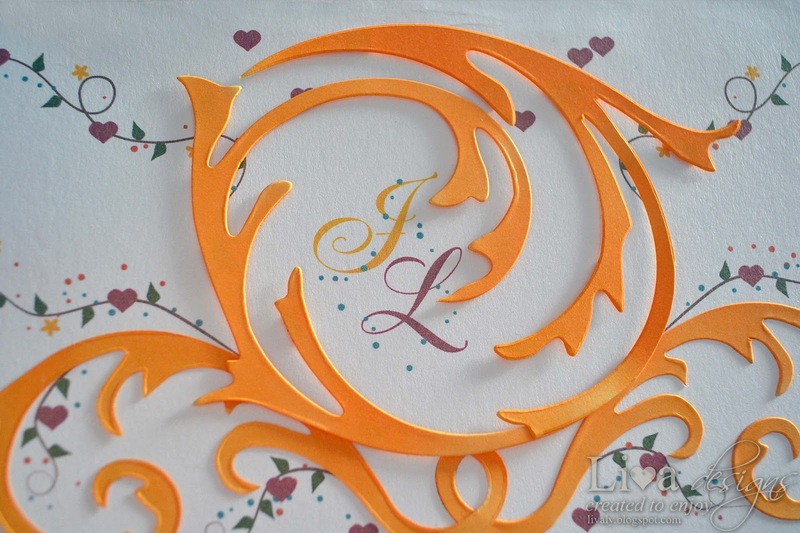 Glue both smaller flourishes at the bottom of your invitation front. See pic for reference. 14. 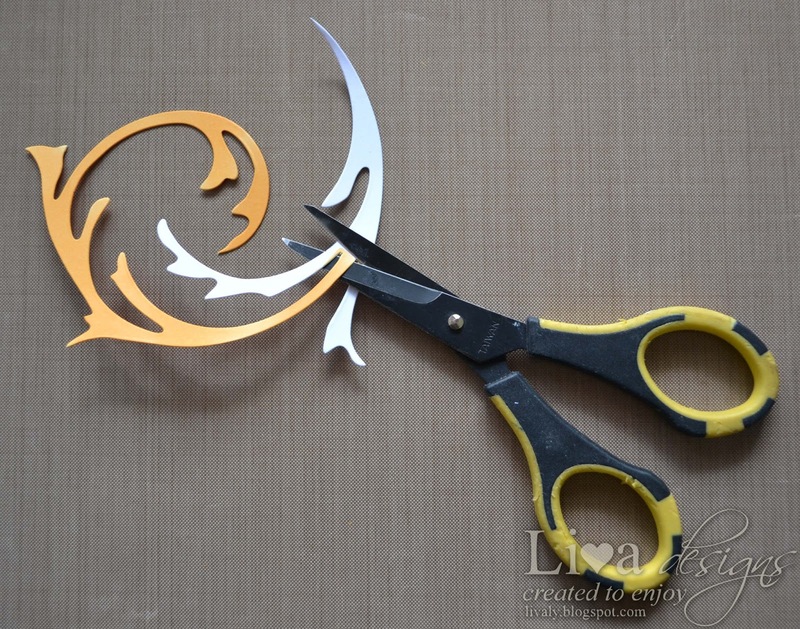 Add foam tape to your round flourish shape. If you have pre-cut foam squares or other shape, don't be afraid to cut them in half, or more smaller shapes to fit your shape. 15. 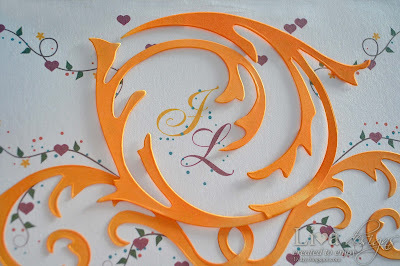 Glue your big flourish around your monogram and over the smaller flourishes. 16. Punch a medium sized heart and color it red. I used Ruby ProMarker. Of-course you can punch it from red cardstock in the first place. 17. adhere the heart to the joining point of your flourishes using thick foam tape. In the end I also experimented a bit with GlossyAccents and covered all the small hearts and flowers as well as my monogram with them for a bit of a shine. 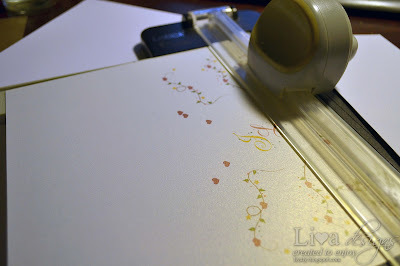 That's all - I hope you like this tutorial and my freebie! All the efforts you had put in it is worth it. 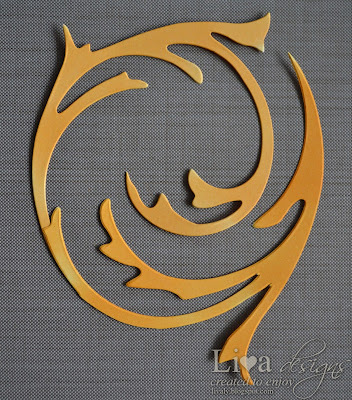 Your creation is gorgeous, Liva! 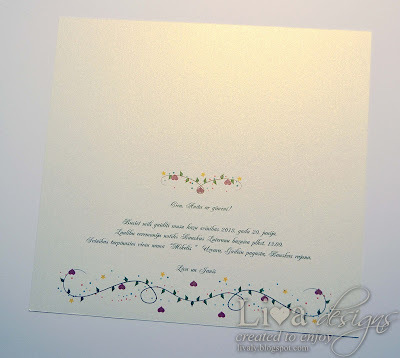 It’s not the kind of invitation that you would just print easily after you picked or made your own design. Yours comes with another task of cutting and pasting some stuff that would turn a simple invitation twice as lovely than it once was.